Item arrived quickly and as described. Fantastic seller! Canceled/refunded order WITHOUT asking. They didn't honor eBay discount coupon. I have the 1 TB xbox one with cooling fan and wireless head set my 1 TB drive was about 75 % full. With 2 USB conections on back in use, I bought a 3.0 Hub(did not want to use side usb) used hub for fan and headset direct plugged drive in turned on Xbox, saw drive no problem followed on screen instructions and it was ready to use. I moved games to external drive, so far no problems. One of my external disks crashed and I bought/upgraded to this 4TB drive to help me with processing video data I shoot at church to make DVDs and CDs. So far, so good. Arrived quickly and setup was easy. Thanks. I have owned it for just a week and have no comment on the reliability. The drive is quiet and speed is good. I have an older Dell OptiPlex 745 running Windows 7 . this external hard drive works great as a backup plus has a bunch of extra storage for other files . this is just a plug and play unit - no expertise needed to make it work . 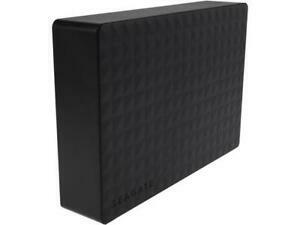 I use it mostly for storing files or pictures -but it will make an excellent unit for a backup drive . very quiet , the only way I know it's on and working is the flashing blue light !! I have had excellent service from all 8 of these I have bought . I would recommend them to anyone needing more space for file storage .